As a keen amateur chess player (and not a very good one) I was interested in a new charity that is being launched to get youngsters from the inner cities interested in the sport. Chess in Communities and Schools is an initiative which is being administered by Malcolm Pein from the London Chess Centre and is loosely based on a similar model which was very successful in New York. The film Knights of the South Bronx was a TV adaptation of the story. 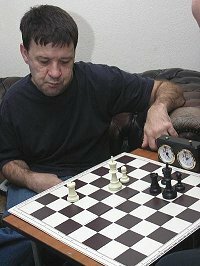 Chess is a sport which transcends boundaries of race, class and status and contrary to what many people believe, you do not need to be particularly intelligent to play it well. Once you have learned the rules (not complicated) and grasped basic theories of the openings your creativity and passion for the struggle on the board will see you through. At Care Images, we were delighted to do a shoot with Paul, a good club player who has a physical disability. The objectives of the charity which has a snazzy operational name of Urban Chess is to encourage the teaching and playing of chess in state schools and inner city communities as well as highlight the social and educational benefits of the game. Already the charity is making inroads in Newham, Hackney, Barnet, Hammersmith, Birmingham Manchester, Liverpool, Teeside and Tower Hamlets in London and with two national fieldworkers in place there are further initiatives planned throughout the country. Importantly, this kind of project can help raise the profile of our young people away from the negativity associated with knives, lack of discipline and general bad feeling which is all too prevalent in our media. There is no reason why one or two grandmasters of tomorrow cannot come from sink estates and Malcolm and his team are to be applauded in trying to unearth some hidden talent.